In the world of luxury travel, as in life, it’s often the small things that matter most. That attention to detail is what sets the true professionals apart from the amateurs, the class acts from the pretenders. And at the recently opened Bürgenstock Resort Lake Lucerne – the largest and, at more than $400 million US (plus a further $300 million to buy the property), the most expensive resort complex ever built in Switzerland – the small things certainly don’t go unnoticed. Take the check-in process. Whether you’re arriving by ferry and funicular (more on that in a moment), private jet, helicopter, or via the resort’s elegant chauffer-driven Bentley, the attentive staff go out of their way to ensure the process is as painless as possible. An especially nice service for jet-lagged travellers (and celebrities!) is the ability to have check-in done in the comfort and privacy of your suite. Not only will your assigned Concierge meet you upon arrival, they’ll ensure the process is seamless start-to-finish, even spending a few minutes afterwards showing you how to operate your suite’s state-of-the-art lighting and entertainment system (easy-to-use master control panels are placed conveniently around the room). It’s just one of numerous classy touches that really sets the tone for your luxury stay, and truly sets this unique property apart. 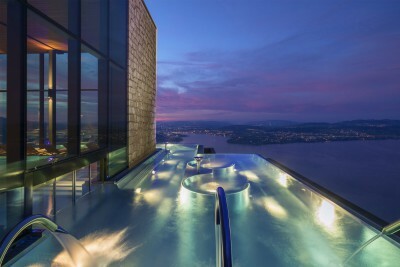 Whether you’re visiting for a weekend or a week, Luxury Switzerland is pleased to share our list of great reasons why Bürgenstock Resort Lake Lucerne really is one of the world’s top luxury travel destinations… and why you’ll never want to leave. Travel – Boat, Train, Plane… or Bentley? Whatever vessel you chose, the excitement starts the moment you head off across the lake. Be sure to take a place at the bow, and you’ll immediately start to feel the excitement build as the resort itself – located some1400ft above Lake Lucerne – edges ever closer. This, and the magnificent views of the surrounding mountains, will definitely be a highlight of your visit. 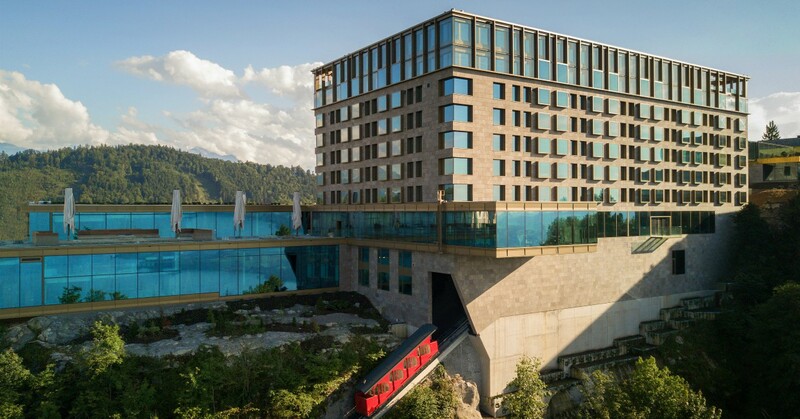 Upon arrival at the resort’s small ferry terminal you’ll then be invited to board the spectacular new Bürgenstock Railway. Running along the original line built in 1888, the anticipation mounts as this wonderful funicular train makes its way steadily upward and gives you a first glimpse of the magnificent views that await. Five minutes later, and you’re deposited directly into the lobby level of the resort’s uber-luxurious five star Bürgenstock Hotel. Other ways of arriving include by private jet (Buochs Airport is just 15 minutes away… by Bentley), helicopter (the resort boasts a number of grassed landing areas) and, of course, by road. Tip From the Top: Even if you miss the chance to arrive via boat and funicular, fret not. 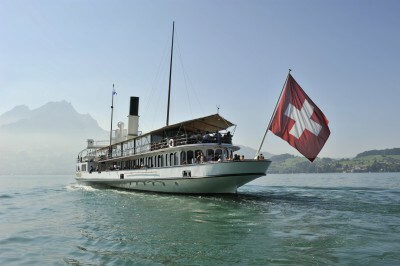 Guests have unlimited access to both when visiting Lucerne, so be sure to allow at least a few hours to enjoy this fun excursion. A number of packages are also available at a reduced rate for guests and include admission to top attractions including the historic Hammetschwand Lift, the highest outdoor elevator in Europe. No doubt you’ve heard expressions like, “There’s not a bad view anywhere,” being applied to somewhere nice you’ve stayed? 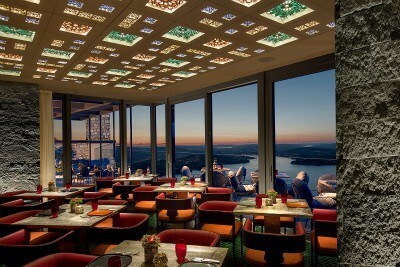 While I’ve certainly said it, I’ll not say it again until returning to Bürgenstock Resort. The resort complex and its 30-plus structures are perched 1450ft (450m) atop a steep ridge on Bürgenstock Mountain, so you really are on top of the world as you gaze down upon the boat traffic far below, or spy upon the tiny specks that are hikers or cattle dotting the valleys below. And it certainly is a panoramic view. A local told me that, on a clear day, you can pretty much see right across central Switzerland as far as Zurich, far beyond the peaks surrounding Lucerne. Of the nearest peaks, none stand out quite so dramatically as the 4041ft (1232m) Mount Pilatus. Considered one of the country’s most storied mountains, it’s not only supposed to be the resting place of a much-feared dragon, but also of notorious Roman Pontius Pilate, whose profile you can make out if you catch the peak at the right angle. Other great views of Pilatus and neighbouring Mount Rigi can be had from most of the resort’s restaurants and bars, from its magnificent spa with its infinity edge pool and from your suite’s bathtub (I kid you not). 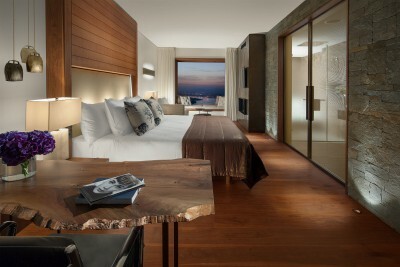 When it comes time to decide where exactly to lay your head at Bürgenstock Resort, you really are spoiled for choice. Boasting four hotels with some 380+ rooms and suites spread across its three-, four- and five-star options, the resort prides itself on ensuring that its spectacular setting and luxurious amenities are, to some degree, accessible to everyone. Leading the way in luxury is the incredible Bürgenstock Hotel, a five star ‘Superior’ offering that certainly sets the bar pretty bar. Each of its 102 rooms and 82 suites comes with its own large brass fireplace, oak cabinetry, walnut parquet flooring, Italian marble rain-showers, and floor-to-ceiling windows (many of them looking down on Lake Lucerne)… and that attention to detail we spoke of earlier is everywhere apparent. This contemporary design is as appealing in the large open public spaces as it is in the each of the guestrooms. For those craving the ultimate in indulgence, the huge 7,230 sq ft Katara Royal Suite boasts all of the above but is spread across six bedrooms plus other living space on the hotel’s top floor. Other features of this uber-luxury offering include a private sauna, massage room, three living rooms, a grand piano, a library and not one, but two, kitchens. A Presidential Suite is also available, though encompassing a much more modest 3,315 sq ft.
Other accommodation options include the five-star Waldhotel Health & Medical Excellence, the historic four-star Superior Palace Hotel, and the cosy three-star Taverne 1879, a traditional style 12-room inn. Wherever you stay, you’ll find yourself enjoying one of the quietest sleeps anywhere, thanks not just to its tranquil setting, but its car-free policy (parking is underground and well away from the accommodations). Finally, two other unique luxury options worth considering are the marvellous Blockhaus, a historically preserved chalet-style residence with spectacular views over the lake; and a selection of residential suites and villas available for rent on a long-term basis, some with separate accommodations for personal staff. Spread around the resort complex’s 148 acres are enough restaurants to ensure you can dine at a different location pretty much every night of a week-long stay (though odds are you’ll find a favourite and want to visit more than once). Serving everything from delicious traditional Swiss regional alpine dishes to fine French dining, along with a variety of Asian and Middle Eastern influence dining options, it’s a gourmand’s paradise. world’s top restaurants – the resort’s phenomenal food experiences have also benefitted from an association with renowned chef Marc Haeberlin. Famous for his involvement with three-star Michelin restaurant L’Auberge de L’Ill in Alsace, Chef Haeberlin has already left his mark on RitzCoffier in the Palace Hotel. In addition to his signature dishes, guests will enjoy sumptuous fare produced in an authentic 19th century kitchen that uses the original fireplace from 1873, complete with more than 100 traditional copper pots – just as would have been used when the resort originally opened over 140 years ago. Talk about attention to detail. Continuing the exotic flavours theme is the delightful Sharq Oriental & Shisha lounge. Serving traditional Persian cuisine, dining here is a little like taking a culinary journey through the Orient – an effect enhanced if you manage to dine in the lovely water pipe lounge. Specialties here include delicious mezze and grilled meats, hummus, falafel and rich, spicy kababs. A personal favourite is Taverne 1879, a classic Swiss-style tavern that specializes in tasty traditional fare such as Älpermagronen (a pasta dish made with potatoes, roasted onions, roasted bacon and apple puree), Rösti and Zürich ragout. Other first-rate eateries include Verbena Restaurant, offering low-sodium, healthy herbal Mediterranean cuisine; and the Oak Grill & Pool Patio, featuring healthy farm-to-table foods including local meats and fish. While there is no end of great places to grab a refreshing alcoholic beverage (you’re on holiday, remember! ), I was particularly taken by the spectacular Lake View Lobby Lounge. Located off the main reception area of the Bürgenstock Hotel, this cavernous yet somehow cosy space was the perfect place to sit and feel like you were part of the action, especially after one or two Whisky Sours. Sit at the bar, or alternatively grab a comfy chair and just observe your fellow travellers, admire the view, or catch up on the news. As an alternative to the evening cocktails, pay a visit mid-afternoon for a spot of tea. Simply sublime. For those seeking an indulgence of another kind, the Cigar Lounge (also at the Burgenstock Hotel) provides a very pleasant, quiet space in which to relax. In addition to sampling great wines, beers and cocktails while you smoke, you can also order from a broad selection of dishes made available from the resort’s many restaurants. 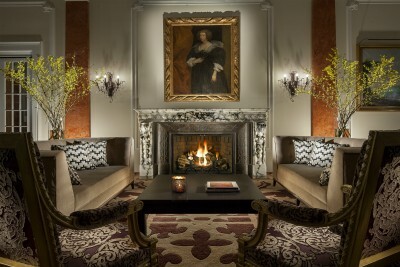 Another delightful spot to sit and relax as you enjoy a drink is the elegant Lobby Lounge in the original Palace Hotel. Here you can partake in sumptuous afternoon teas while basking in the beautiful décor, or al fresco on the hotel’s large terrace. Bryan Dearsley is Editor-in-chief of Luxury Globe Media, a leading source of news and reviews related to luxury experiences, lifestyles, and travel. He likes Switzerland. A lot.